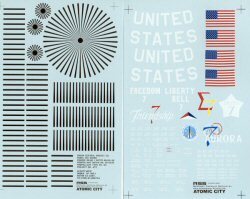 A new company has come forth called Atomic City. 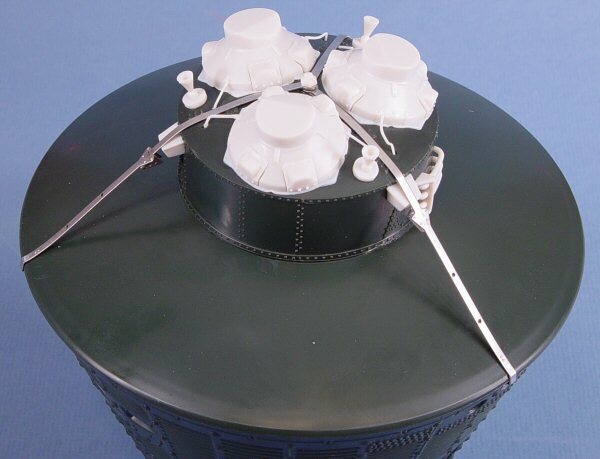 They've teamed up with MRC to begin production of a series of spacecraft kits. Their first offering is a stunning 1/12 scale (!!!) 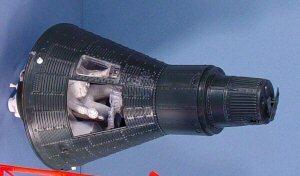 Mercury capsule, the first US manned spacecraft. MRC recently sent a pre-production test shot of the new kit for a quick build to make sure that it is ready for prime time. I assembled the kit from some early draft instructions, and with one exception, had absolutely no problems with the model. I left the assembled model unpainted to see where various bits go and to show you that no heroic filling or sanding was accomplished. Any gaps or problems in the assembly will show up. I used Tamiya thin cement for most of the assembly, with a bit of cyano to bond the non-styrene parts to the kit. Molded in an interesting array of colors (shades of Matchbox! ), the outer hull is molded in dark gray styrene, the interior parts and portions of the retro pack are molded in white styrene, the escape tower and the escape hatch (with the explosive bolts) are in bright orange styrene. 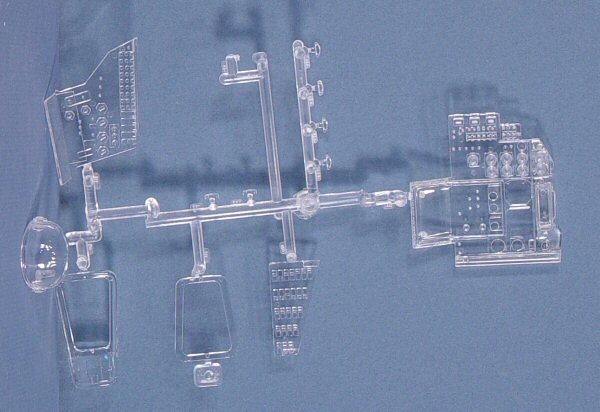 A tree of clear styrene is also included with the astronaut/pilot's window, astronaut's helmet visor, and instrument panels. 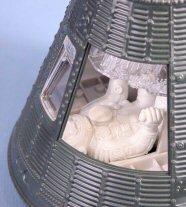 The astronaut figure is one solid hunk of vinyl, with works very well to keep the center of gravity low on the model (ballast) when the escape tower is fitted. My favorite part of the kit is the brilliant engineering with the retro pack retaining straps. As with the real vehicle, these are metal bands with some nice detailing to boot. 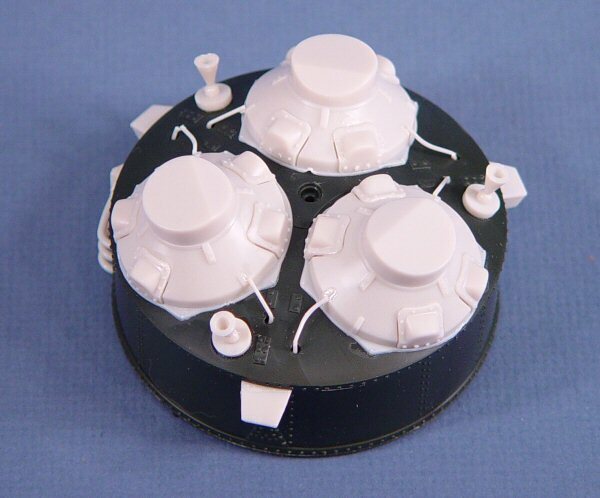 One end of each of the three straps is pinned to the center of the retro pack and the other end literally snaps over the side of the heat shield and against the base of the capsule. Two sheets of decals are provided with the kit. 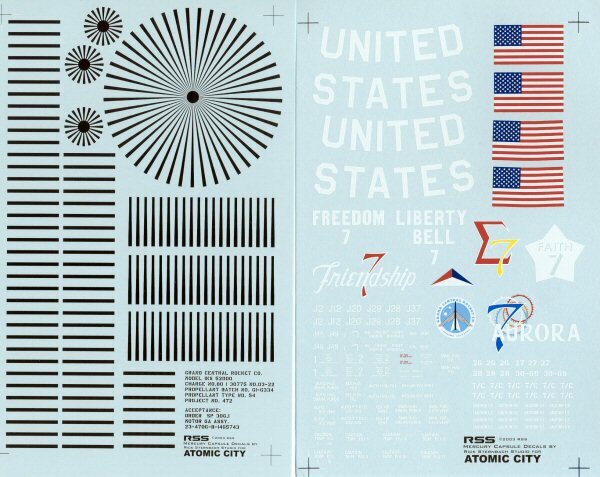 One whole sheet has all of the photo calibration markings that go on the retro pack, the other sheet contains markings for all six Mercury missions. Okay, the test assembly was done according to the draft instructions, and as I said earlier, with one exception, all went together smoothly. 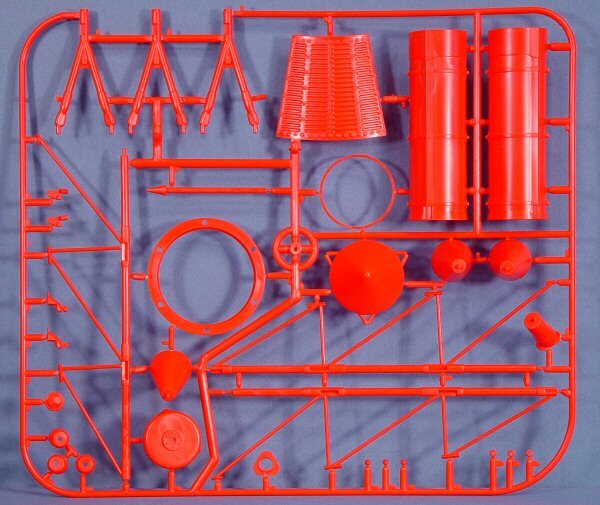 The retro pack alone (pictured above) is quite detailed. 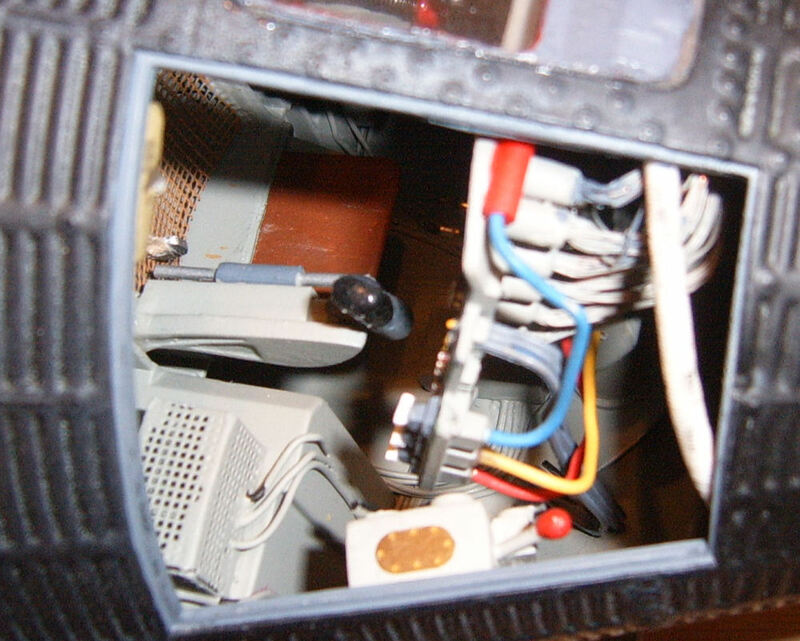 The capsule interior is very nicely engineered and to be honest, I was having so much fun at this stage that I forgot to photograph the interior before installing it inside the capsule shell. What you will note is that there is detail molded on the back side of the instrument panel to represent the instrument cases that protrude out the rear of any instrument panel. This is a very nice touch indeed! No instrument faces are provided, but you should be able to create your own from photos in the NASA archives. 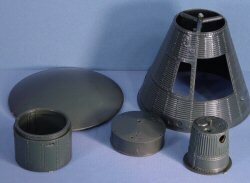 The retro pack and heat shield are attached to the capsule shell with these metal bands. These do snap nicely into place should you want the option of removing the heat shield and interior periodically. Since I wasn't aware of this intent during the test build, I had cemented the interior into the capsule shell and cemented the heat shield and retro pack into place before installing the metal bands. You can go either way here. This is also where I encountered the only problem with my test build. 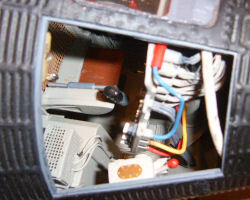 There is plumbing and/or cabling that runs from the base of the capsule shell, running along the metal straps and into the retro pack. I couldn't make out how the various parts are installed and no amount of dry-fitting would help, so I left them off this build. 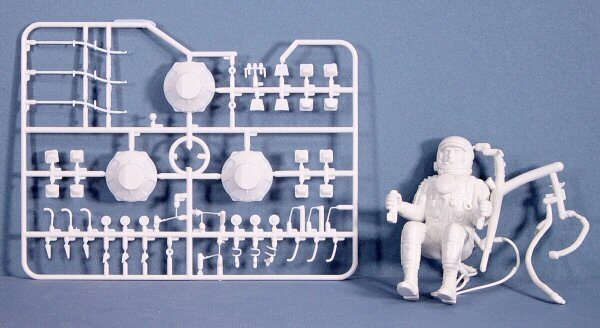 I'm told that the instructions will be improved here in the production version. The nose of the capsule contains an instrumentation package and cameras. One of the cameras looks forward and the other out the side of the nose. The forward-looking camera has a hinged protective cover that is also hinged with a metal pin in the kit. The details up here make it appear that the nose should be removable, but there isn't enough overlap of the nose and capsule shell to hold it in place with friction alone. I opted to cement this as well. 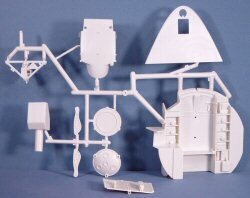 The escape tower is a detailed model of its own right. It goes together smoothly and it does friction fit over the nose. You can see the size of the escape tower against the capsule in the photo to the right. Here is the completed capsule on the left. 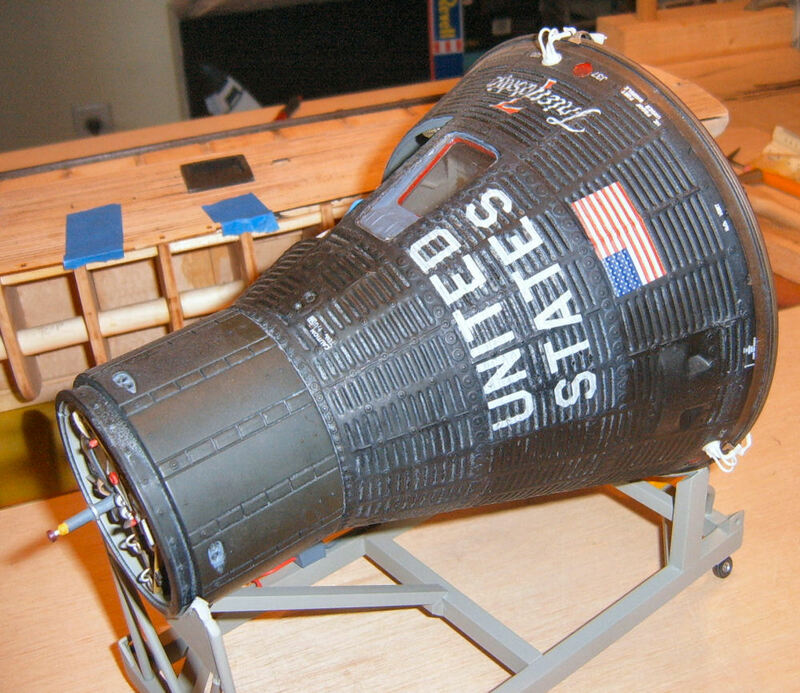 Remember that none of the parts have been painted (as if you couldn't tell by the bright orange escape hatch!). 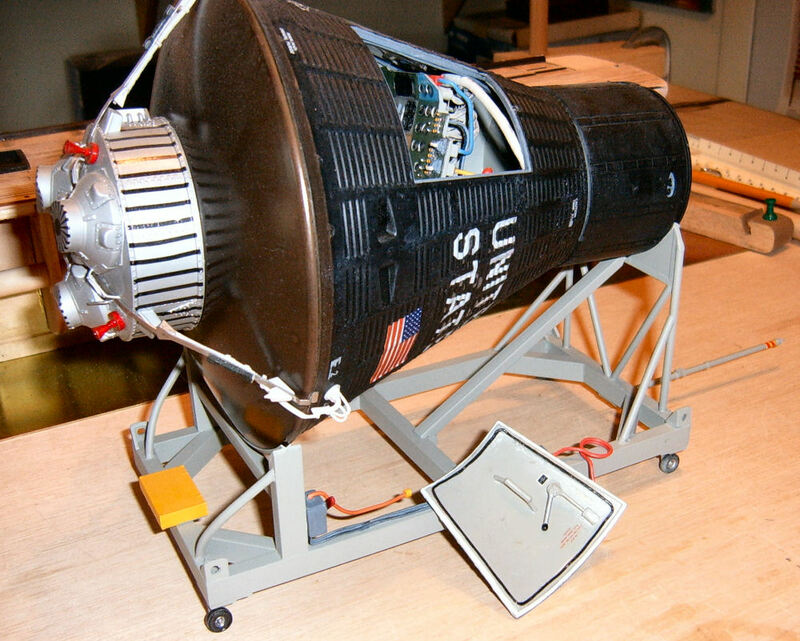 The model stands over 26 inches high with the escape tower installed! Thanks to MRC for the review sample! 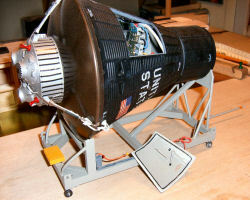 Here's a look at Lester Palifka's build of the Friendship 7 Mercury capsule. 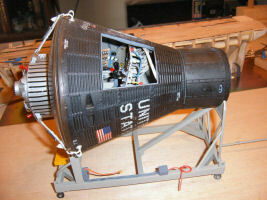 According to Lester: "About the Mercury capsule, you might want to mention a few things that I found while building this one. As you can see I didn’t use the vinyl figure…..what I did was cut off his hands and used a dremel tool to shape the hand grips…. One was that if you were going to put the strips on the retro package you need to put them on after painting but before assembly. 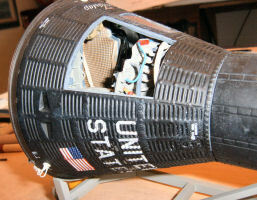 Especially the large sheet that goes on the main part of the pack that gets mounted to the heat shield. 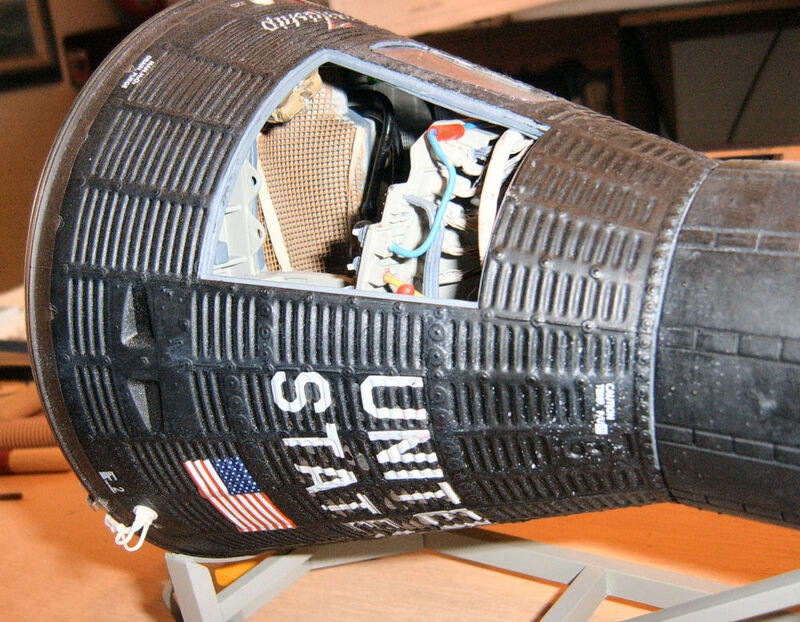 Also to get the color of the heat shield that was made of a composite material. 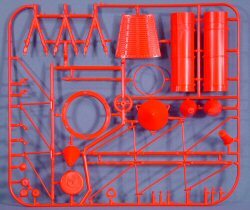 I first used a reddish/brown paint then put on several coats of smoke window tint until I achived the color that you see…also a lot of the smaller parts I re-did out of brass tube and wire as the plastic parts on the sprue were just too fragile."